Tell Mother Nature Hurricane Season Starts in Six Days! That would be the 2011 Atlantic Hurricane season! 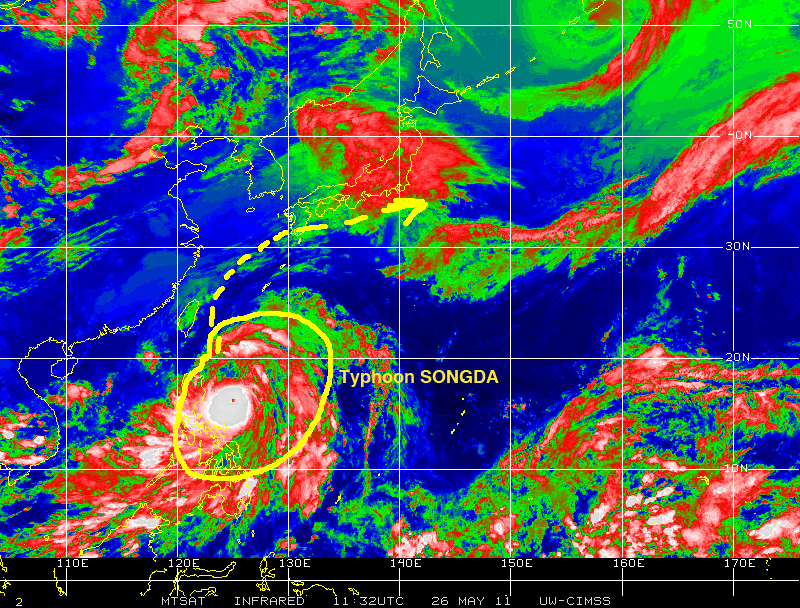 Does Mother Nature know she has to punch a time card on 1 June 2011 and start working on her cyclogenesis? Nine weeks ago as Earth’s mid-section crossed directly under the Sun during the spring equinox the oceans and atmosphere north of the equator started growing warmer. As the coupled ocean-atmosphere system in the northern hemisphere deals with more heat there has been a gradual increase in the number of so-called weather events, as Nature uses its arsenal of processes in a continuous balancing-between-extremes act, which is often punctuated by extreme events when conditions reach levels of critical instability. So far in 2011, anecdotally at least, there appears to be a continuous chain of weather events punctuated by extremes especially as winter gave way to spring, and now as we approach summer in the northern hemisphere. The pulses of large storm systems that have spawned East of the Rockies to then proceed eastward creating havoc across the great plains, and the south and the central regions, as well as in the northeast with hurricane force winds, extreme rain, hail, thunderstorms and devastating deadly tornado swarms, in addition to record-breaking spring flooding in the Mississippi, Missouri, Ohio, Red River and other basins, certainly bear witness to the frequency with which these extreme events are happening. Confronted with these events and as the media have continued to bombard the national public with reports of death, destruction and damage, and at times all too graphic imagery of despair and human suffering, the inevitable questions of: why is this happening? Is this related to global warming? and others, are on the table to be debated and pondered by everyone. Not surprisingly, as the debate of these issues heats-up and the scientific community takes positions on both sides of them, there are few or no answers as to what it all mean or what can be done. While technical explanations have been provided as to what has caused given events, by and large we are seeing more of the same with respect to the discussion on global climate change and global warming. With this as a backdrop here we are just six days from what we call the 2011 Atlantic Hurricane Season seeing plenty of hurricane guidesbeing distributed through various means, special reports in the electronic and printed media, and the conferences and reminders to be prepared, to have a plan, to have a hurricane kit and in general the obvious one: to deal with the fact we live in Florida otherwise known as hurricane country. 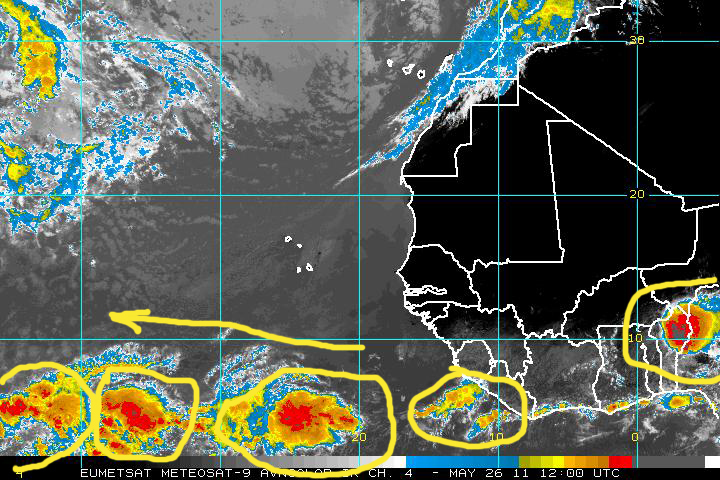 Today 26 May 2011 we see plenty of signs that various components of cyclogenesis [the generation of tropical cyclones – hurricanes] are already in place or at work in the northern hemisphere. Tropical waves similar to those shown of the satellite image above have contributed to heavy rains and flooding over the northern regions of Venezuela and Colombia earlier this year. 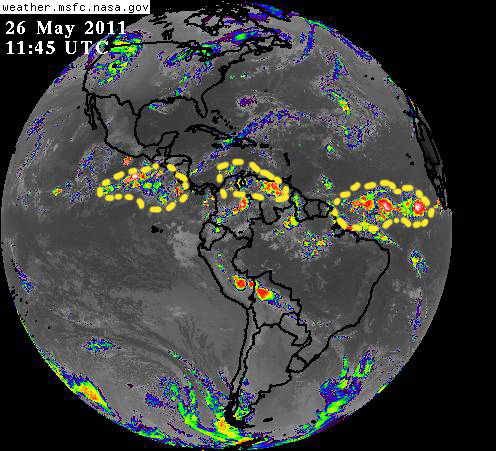 Also, some of these waves traverse over the isthmus of Panama and emerge over the eastern Pacific to interact with La Nina influenced waters and atmosphere, which has led to a pattern of large rain and thunderstorm cells generated over the area and affecting several countries in Central America similar to what took place in 2010 over the same region. The eastern Pacific 2011 hurricane season officially started on May 15 2011. Only time will tell how “busy” the 2011 Atlantic Hurricane season will turnout to be or if global warming contributes in any way to exacerbate the impacts of tropical cyclones that do form over the Atlantic in 2011. What is clear is that Mother Nature will continue on its quest for balance between extremes in response to that which is a constant: change! Spring is here and with it snow-melt, which is feeding the flooding season. Although some regions are still feeling the effects of parting shots from winter, spring is really taking charge of our weather. This map shows the location of flood gauges around the country. The purples and reds show areas where major flooding has already occurred or where rivers in the area are nearing major flood stages. 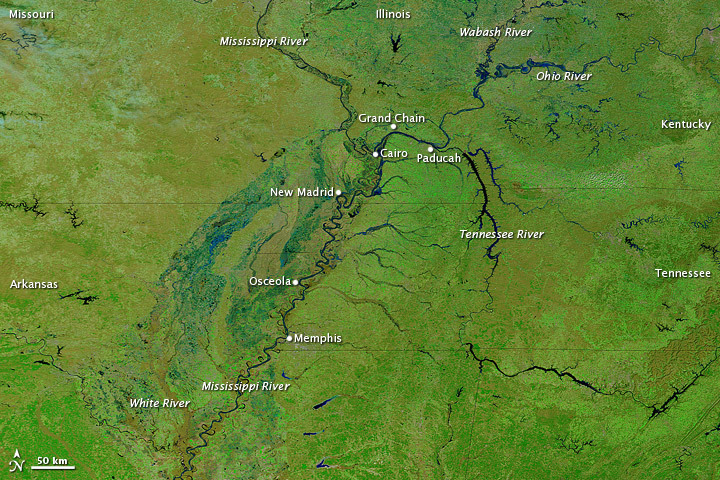 View of a section of the Mississippi river before the genesis of current major flooding events. 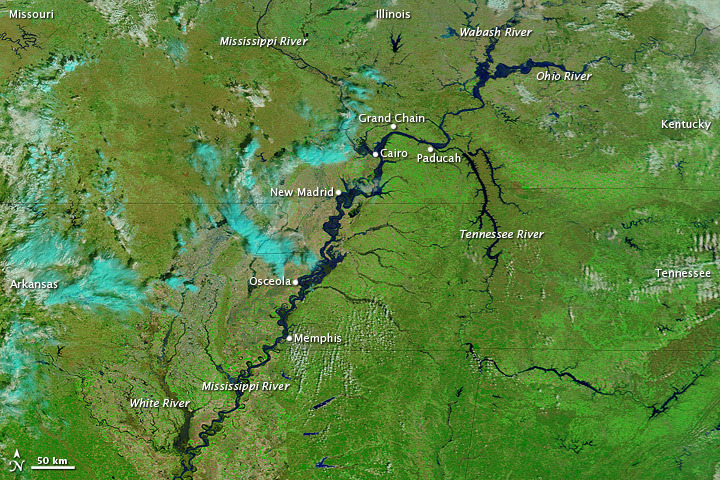 Same section of the Mississippi river, taken just a few days ago, showing how the river has reached major flooding stage at several locations over-topping its banks. While these flooding events are happening, spring has also brought extreme wind conditions, increased temperature and thunderstorms, which have in turn created fire weather conditions, especially in areas that have suffered drought . Over the past few months we have seen the progressive transition from extreme winter weather events with several instances of paralyzing snow, and ice storms around the country, to the arrival of spring and with it major flooding events, potential for wild fires, which will soon lead to the arrival of the 2011 Atlantic hurricane season. All of these hazards highlight the vulnerability of the USA to extreme weather events, which often results in damage, injury and loss of life. This also highlights the need to be prepared and, above all, to practice hazard mitigation!